By Fr. Paul Hansen, C.Ss.R. Fr. 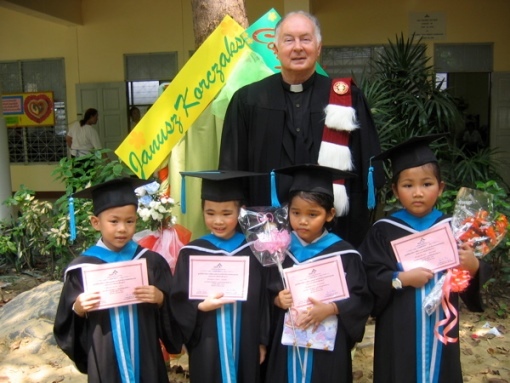 Joe Maier, a Redemptorist, is often referred to as the male Mother Teresa of the slums of Klong Toey, Bangkok. Fr. Joe has lived and worked in the slaughter house district of Klong Toey for over 40 years. He has opened schools for the poorest of the poor. He has worked to house street children with AIDS. Fr. Joe has taken children out of the prisons and given them a home. Over these more than 40 years of real presence, the less fortunate and abandoned have been given a chance and lots of hope. As Pope Francis would desire of his priests; Fr. Joe “has the smell of the sheep” all around him. Below is a short video about the work Fr. Joe is doing at Mercy Centre. For more information about Mercy Centre and how you can help, please visit www.mercycentre.org . The password for the video is mercy. Mercy from Cathy Pearson on Vimeo.